King Lysandus was the ruler of Daggerfall before King Gothryd, and also his father. Lysandus was the son of Arslan II and Queen Nulfaga, and husband of Queen Mynisera. The former Daggerfall court corceress Medora Direnni was his mistress. 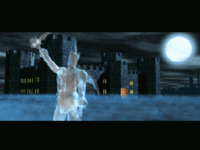 He died at the Battle of Cryngaine Field in 3E 403, but returned as a ghost to haunt the streets of Daggerfall at night. The only word he ever speaks is "vengeance". This page was last modified on 13 August 2018, at 14:58.